The charity’s objectives are to aid young people in sport in the event of them being deprived of an opportunity to progress on their journey, unexpectedly or denied inclusion in to sport through various obstacles. We have utilised A.N.D.Y.S name to formulate the following logo in the form of an anagram. His passion and desire in seeing children develop was evident for all to see, by all who knew him. In his 35 years he played many different sports as an excellent athlete, in addition to countless hours coaching children of all ages, both in the U.K and in America in various sports. Having coached football on soccer camps in America for four years, Andrew also worked in England as a National Bike Ability Instructor and mentor, throughout various areas. In the Yorkshire and Lincolnshire region he coached and worked in many Primary and Secondary schools on a multi sports basis engaging the children in games of rounders, tennis rugby, basketball, cricket and netball. Latterly he also coached vision and hearing impaired children in various sports. Andrew also coached a boys Sunday League Football team, which featured his nephew Reece from the age of 8 years until his tragic passing, when the team featured as an Under 18 team representing North Ferriby United in the F.A Youth Cup. He led the team to tour Holland in 2013 and 2014, which offered the players a trip of a lifetime. Throughout the years of coaching his club team, he was also elected by the Hull & District Youth Football League to coach various Representative teams and had a large hand in the progression of some of his players signing professional football contracts, with one player now playing at international level. Andrew was also recruited to work for his hometown club Hull City in their academy and was working for the club up until his sad passing. Due to his vast experience in many sports and varied locations of work both in the UK and America over 750 people attended his funeral in November 2015. Andrew’s dedication, passion and popularity with all who knew him, became evident when he was voted the National Winner of the Grassroots Community coach of the year in 2016 in a national poll. The award was made at Wembley Stadium on the pitch before the Community Shield match between Manchester United and Leicester City. 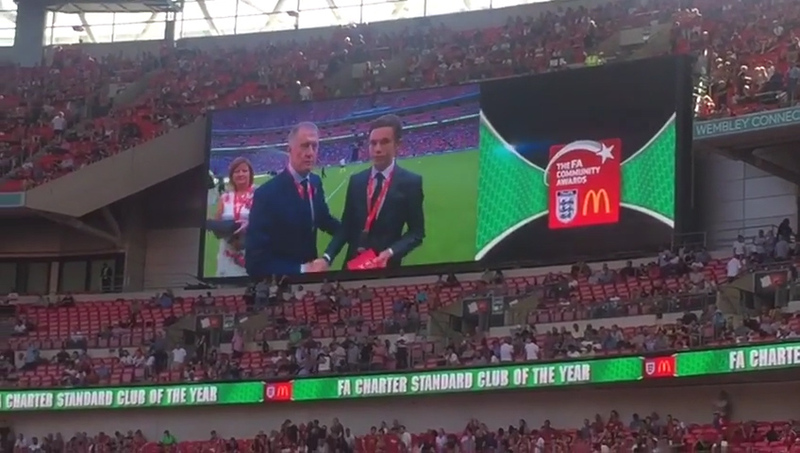 The award was presented by Sir Geoff Hurst to his nephew Reece Martin. Andrew was also nominated by the English F.A to represent England in the U.E.F.A Leaders award in 2017 which is a European poll in which he was not successful in winning. Such has been Andrew’s popularity, many people felt that his contribution to children and young people’s development should be maintained, as a legacy, to his wonderful contribution towards aiding children in the event of their journey being cut short, as was the case for Andrew.